It’s always seemed to me that portraiture is a particularly demanding type of painting, at least the kind of portraiture in which the artist is commissioned to create the portrait, as opposed to an artist who paints someone simply because they find them an interesting subject. Not only do you have the exacting demands of producing a likeness, which requires very careful observation and, depending on style, faithful reproduction of that likeness with careful draftsmanship and rendering; a commissioned portrait requires that the client, whether the individual themselves or someone related, be pleased with the result, which is an issue faced more often by illustrators than gallery artists. If someone doesn’t like your landscape, they pass by in the gallery and you can sell it to someone else. A commissioned portrait has a very limited market. Some artists thrive on the practice, though, and history’s great painters have included numerous portrait painters. The modern practice doesn’t get as much attention as some other types of painting, but there are portraits artists who are at the top of the game and get a great deal of respect from other artists as well as their from their patrons. Nelson Shanks is one of the latter. With a background in academic art training that he “pieced together” from various teachers and sources, both here and in Europe, Shanks has established himself not only as one one of the country’s premiere portrait painters, but also as one of the major proponents of classical realism. Shanks, along with his wife Leona Shanks, is the founder of Studio Incamminati, an atelier style teaching program here in Philadelphia, which focuses on the principles of classical realism. Shanks’ commissioned portraits include such notable figures as former presidents Bill Clinton and Ronald Regan, Pope John Paul II, Margaret Thatcher, Princess Diana, King Gustav and Queen Silvia of Sweden, Queen Julianna of the Netherlands, Luciano Pavarotti and numerous CEOs and chairmen of boards, including those of the Museum of Modern Art, the Metropolitan Museum of Art and the New York Times. His web site has a few of these portraits, as well as figure paintings and a few other subjects, but the images are frustratingly small. 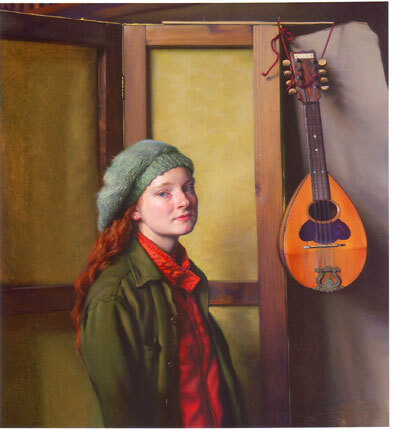 There is a selection of larger images on the Art Renewal Center, which also has a separate article on him as a “modern master”, Nelson Shanks, Humanist Realist. Personally, I’m more interested in his figure painting, which is superb, and his portraits of non-famous individuals, in which you can more clearly see the painter as a painter, rather than as a painter in that particular role of portrait painter of notable figures. It is here, I think, and in those rare excursion into landscape, and particularly interior scenes, where Shanks shines. I respect this guys’ work. The first time I saw his work, it was in an American Artist magazine in Nigeria in the early 90’s and I was shocked to see how realistic his portraits were. I have seen many of his works since then and one thing that surprises me is the number of colours he has on his palette. Great artist! I’m not a religious person by any means but Shanks’ portrait of John Paul II exhibited here in NY before it was shipped to the Vatican two years ago managed to accomplish a wonderful blend of personality, charisma and dare I say spiritualism that takes the viewer considerably deeper than the superficial likeness on which even the technical brilliance of accomplished realism can rest. Likewise his portrait of Diana seems to penetrate the forlorn melancholy attributed to her. But the Reagan portrait looks like an actor playing the part of an important man, which I suppose is exactly who he was. There’s lots of lovely paintings on the Studio incamminati site but what a frustrating site aaaagh!! That is an intense portrait. It captures so much emotion in such a still moment. It’s not at all a tradtionally flattering portrait; I love that. I agree with you 100% Charley, that Shanks’ figure paintings are more interesting than his celebrity portraits I thought his portrait of President Clinton was simply dreadful– awkward and artificial and out of balance. I know that Shanks has been the rock star of the Art Renewal Center crowd for a long time, and he is certainly is to be applauded for his great commercial success, but I don’t think his work compares well at all to other current painters in the ARC genre, such as Jeremy Lipking or Adrian Gottlieb. Perhaps they need a better press agent. I’ve been particularly interested in the increasing presence of atelier style teachng studios, and Shanks’ Studio Incamminati is here in Philadelphia, so I hear about it more frequently, though I haven’t had the opportunity to visit yet (and Julian is certainly correct that their site could be easier to navigate). Yes, there is a tendency for the Art Renewal Center, which is one of the web centers for neo-academic art, to focus on certain individuals, but I suppose everyone (and I’m raising my hand here) has their own particular bias when it comes to who to emphasize. I’ve featured Jeremy Lipking, and Adrian Gottlieb is on my list, so I am trying over time to include a number of the terrific new painters working in the academic tradition. seems Nelson uses the same background ,what a drag for a good artist and i heard he partly works from life then most of it is done from photo ? also about Lipking i hate his work some of them look like rip off of other artist . Adrian Gottlieb just won second place at the 2008 Portrait Society of America’s International competition and he won Best of Show last year. In March he returned to England for the official unveiling of his official portrait of William Herbert, the 18th Earl of Pembroke and 15th Earl of Montgomery at the Earl’s historic palatial estate in Wiltshire. He spent most of last summer living on the estate and painting the Earl and his dog Tate from live sittings in a studio prepared for him in the great house. The Earl chose Adrian Gottlieb even though he is an American and he flew him to England to paint his portrait. That says a lot. I think he’s the new star of his generation and he’ll ultimately replace the old guard that’s gotten so much free publicity from the ARC crowd. He’s a brilliant painter and if anyone attended the PSOA convention this year, they know his work stands out like a jewel in a simple setting. He’s understated and sublime. It’s true, the guy does need a press agent because he doesn’t seem to promote himself or even write press releases the way the others do. I’m told he’s very personal and not overly self absorbed and while that’s a good personality trait, in today’s world the squeakiest wheel gets the most oil, not the most talented but the most promoted. I think he’s the one people should be watching and I wish somebody would interview the guy. All the information about him is old stuff. Micheal i am sorry but i disagree their are many like Gottlieb and yes i have seen the portrait of Herbert and think he is well promoted through the internet .Question isn’t this section about Shanks . i find it very tacky to write about someone else when it is not about them ‘a little rude .. When are you going to review the works of Adrian Gottlieb and Jeremy Lipking? Newer works please. Whenever I read anything online about these painters, especially Gottlieb, the article focuses on student studies done years ago and then complains his work looks like atelier work. He’s not the same painter. Wish someone would actually interview these people. I did do a post on Jeremy Lipking in 2006, but he’s certainly worth an update; and I haven’t covered Adrian Gottlieb yet. Great suggestion. Thanks. I was Nelson’s personal apprentice in his Chelwood studio from 77-80. Also studied with Henry Hensche for several summers in Provincetown Mass. As for his art he is a great technical painter. Don’t think he is a top notch artist like Freud or Kock. I helped build his studio their on the Andulusia Estate. I hope the floor still creaks! Steve, Thanks for your personal insight.